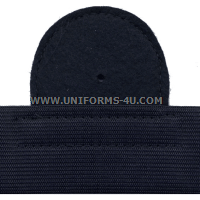 Similar to the design employed by the U.S. Navy, Coast Guard Combination Caps feature a removeable hat band with an insignia mounting area for attaching cap devices, eliminating the need for a grommet hole in the fabric of the cap’s crown and also reducing stress on the fabric. The Coast Guard’s cap device for by all Commissioned and Warrant Officers is decidedly larger than the devices worn by junior enlisted Guardsmen (E-1 to E-6) and CPOs (E-7 to E-9), largely due to the spread wings of the eagle. Our CPO/Enlisted hat band, on the other hand, has a smaller but perfectly proportioned mounting area for placement of the Coast Guard medallion (junior enlisted) or the fouled anchor and shield of Chief Petty Officers.